Hybrid smartwatches are getting smaller and smaller and that's good news. 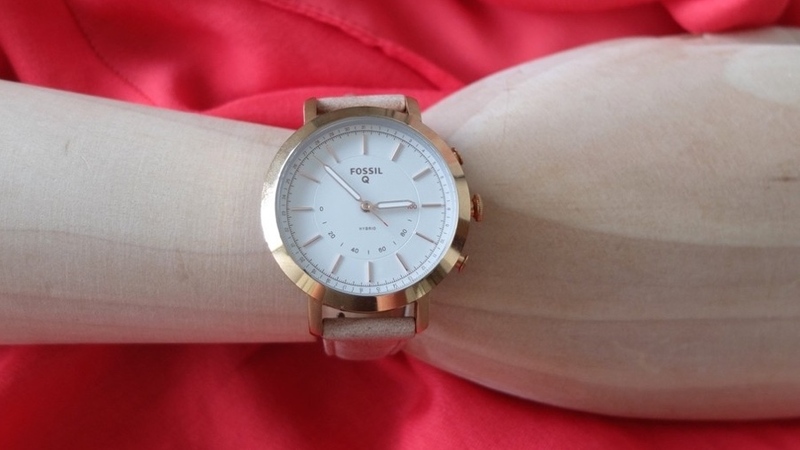 The Fossil Q Neely doesn't just look like a regular fashion watch, it feels like one too. This is a smart and stylish hybrid watch that offers just the right amount of connected features and basic tracking for anyone who thinks smartwatches these days are still just too big. It's an affordable option, more so in the US than Europe, that will handle phone alerts, let you control music and photos and keep tabs on your steps and sleep – all without the need for an unsightly touchscreen. It's also one of a whole troupe of fashion hybrids not only from Fossil, but its other designer smartwatch brands such as Skagen and Michael Kors. We've been living with the sleek hybrid watch to find out if one of Fossil's smallest smartwatches yet deserves a place on your wrist. The design of the Q Neely is the star here. It's one of the smallest, lightest and most comfortable hybrid smartwatches we've worn and will suit women, people with small wrists and anyone who sees the size and shape of smartwatch form factors as a dealbreaker. The Q Neely is a 36mm watch with a 12mm thick body – though it looks slimmer than that on the wrist – and it uses 16mm interchangeable straps. The model we tested has a shiny rose gold finish body that comes with a bone leather strap – this does get grubby quickly though, so either be careful to keep it pristine or buy a few alternatives. The Q Neely is also available in rose gold with a cabernet leather strap and a silver finish with a black leather strap. The lugs are just as petite – everything here is small and perfectly formed. All of them can sit on your wrist and go absolutely unnoticed as a smartwatch – the main appeal of this type of wearable. It's worth noting that Fossil has a lot of hybrid styles now, all offering the same features, and most like the Q Neely based on existing Fossil fashion watch styles. (The Neely is only 34mm so still a little ways to go downsizing). It's worth also taking a look at the Q Jacqueline, Q Virginia and Q Accomplice as well as the slightly dressier Skagen Signatur T-Bar – another Fossil Group brand, which is also 36mm and 12mm thick but with no lugs. You can get the exact same features on hybrid watches from Kate Spade, Marc Jacobs, DKNY, Michael Kors and more too. Considering there's no touchscreen, Fossil packs a lot of smartwatch-like features into the Q Neely using its 0-100 dial, watch hands and buttons in clever ways. Some work well, others don't. Most require you to keep your smartphone's Bluetooth turned on to keep them connected as well. First up – the Q Neely handles smartphone alerts for texts, email, calendar events and social media apps etc, so you get a gentle vibe on your wrist when one comes through, plus you can alter the vibration strength to suit you. In the Notifications screen of the Fossil Q companion app, which you need to download to get going, you can assign each number on the watch face to a contact or app. This works if you assign say 3 or 4 (e.g hands move to 1 = WhatsApp, hands move to 2 = Gmail) but after that we simply struggled to remember. You can also set multiple (two) time zones up and also program an alarm/reminder buzz to wake you up in the morning, use as training intervals or just remind you of something else with a little hybrid watch jolt. That's all well and good, but the most useful feature is probably the set of programmable buttons on the right hand side – there are three, the 'crown' and two smaller buttons either side. Go into the Device section of the Fossil Q app (for iOS and Android) and you can set these up to do all sorts of things. Our favourite is setting up play/pause for smartphone music controls, but you can also set it to: handle volume up or down on Spotify/Google Play Music/Pandora/Apple Music/iTunes/Soundcloud; take a photo from your phone camera app or direct to Snapchat; activate a Find my Phone function; switch to the second time zone and even view the arrival time or travel time for a preset destination. A lot of these work if you have pretty rigid habits, for example the commute time works if you set your work address and travel around the city a lot, say. A nice touch is that you can choose three functions and save these as a preset such as Music or Fitness – these just require a one tap 'Set to watch' to switch between. Again, we wouldn't recommend mucking about too much though or you'll end up forgetting which button does what – find three that save you time and stick to them. The other way to use the Fossil Q Neely is as an activity and sleep tracker – in this way, it's up to you whether you keep it connected to your phone via Bluetooth or let it track you during the day then sync up every evening to view your progress in the app. The Fossil Q Neely tracks daily steps, distance and estimated calories burned on the activity side, with a glanceable Today view in the Stats screen of the app alongside weekly/monthly charts. For the basic sleep tracking, you can track how many hours and minutes you got in last night, as well as how many minutes you were awake – again with a weekly tally so you can see the past seven days. The Q Neely isn't designed to do what say a Fitbit Alta HR, or even a Nokia Steel HR, can do. Not only does it not have a heart rate monitor but it also doesn't offer up as detailed fitness stats, or the kind of personalised insights or fitness social networks that you need to make real change. Both the activity tracking and sleep tracking are accurate enough when compared to a Fitbit Alta if you just want to compare active and inactive days and get your overall steps or sleep time up over time. But if you're getting into running or similar, we'd recommend looking elsewhere. The Q Neely might also work as a second device, to wear to work if you don't fancy the Fitbit look – you can link it up to Apple Health, Google Fit and Under Armour Record. The app is nicely designed with a softer UI than we're used to seeing, but there is some bloatware in the form of links to Pinterest and random social media pics that we could do without. Syncing isn't too much of a pain but can take a while, so be patient. This is a big reason to go for something like the Q Neely over a full-screened smartwatch. The battery life is estimated at six months and we can confirm that the coin cell in this hybrid at least is good for at least four months as we've been wearing this watch off and on since January. And it's hard not to overstate how nice it is not to have to charge your watch every day or two as per Apple Watch or Google's Wear watches, or every five days as you would with a Fitbit. You can see a rough estimate of how much battery you have left by opening the app, tapping the watch icon in the top right and looking at the battery icon under the name of your device. When it runs out, you simply replace the coin cell battery, and what's nice is that Fossil is actually selling both these batteries and replacement chargers (for the touchscreen watches) itself now – they're online and we'd be surprised if they're not in stores too. For casual tracking and discreet features in a (very) compact, stylish package, the Fossil Q Neely is a strong choice. How much of an affordable option this is depends on where you live – it's much cheaper in the US right now – and if you're serious about sports tracking, you need to go elsewhere. But if you've been looking for something small and light enough for everyday wear, the Q Neely will definitely have appeal.